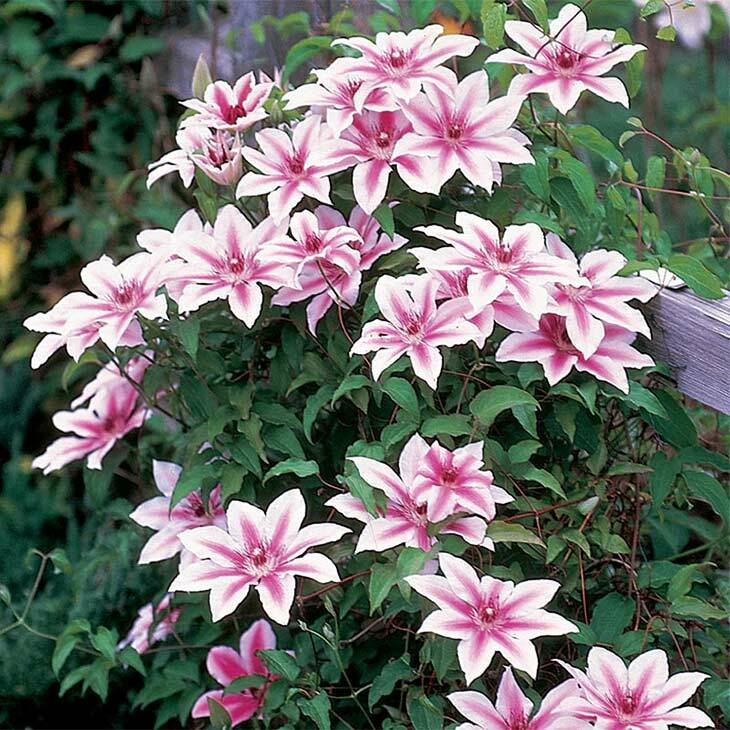 Clematis vine is one of the most loved garden vines of all time. From the most famous English gardens, to our grandmothers’ backyards, clematis have long been the “Queen of Flowers”. The blooms are gorgeous! There are varieties that grow in a restrained, formal way, and others that ramble comfortably along a huge arbor. Some are highly scented, some have tiny flowers and some huge, but all are exquisite flowers. But clematis vines are also know to be a bit finicky to grow. We don’t want you to get scared off by that, because with the right tips & tricks, anyone can plant clematis and learn to care for it too! Wanna know what you’ve been missing? Learn how to grow & plant clematis, pruning techniques, and even our favorite varieties! When planting clematis, choose your location carefully. Clematis like to have cool roots, This means they are perfect for planting among a bed of foliage, or behind some low growing shrubs. They will want to get some sun on their tops. But cool roots, sunny tops. That’s the place to plant them! 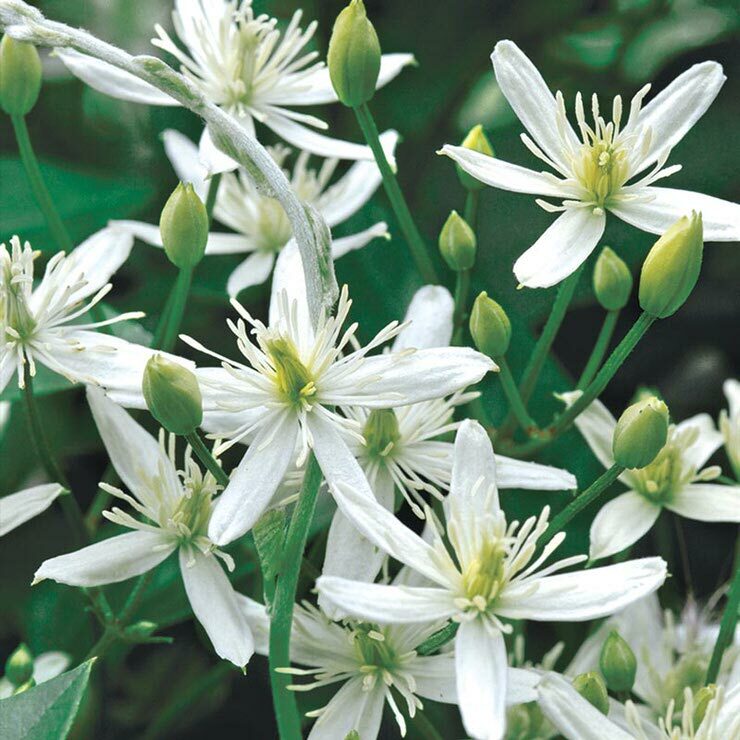 When to plant clematis? You can either plant bare root in the late fall or early spring, or from pots in the late spring, early summer. We don’t recommend trying to plant them in the heat of summer. Dig a hole twice as large as the rootball, and add organic matter to the hole. Clematis love rich soil. Plant 3 inches or so deeper than it was planted in the pot. This will protect any new buds forming at the base of the plant. Treat the roots gently and place in hole. 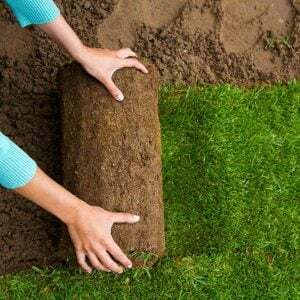 Gently pack in fresh, amassed soil. Water and fertilize. Clematis like their roots to stay moist, but not waterlogged. This is where adding organic matter to the planting hole comes in. Do not let the roots of your new clematis vine dry out. Clematis are also heavy feeders. Fertilize every 4-6 weeks during the growing season. 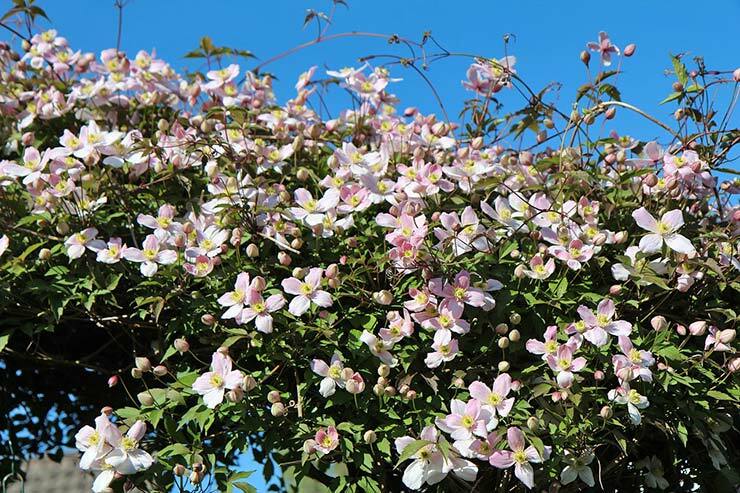 You must provide a support for the clematis vine to climb from the beginning. 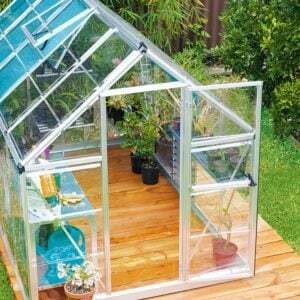 They need something small to grab onto, such as netting, wire cloth or trellis. 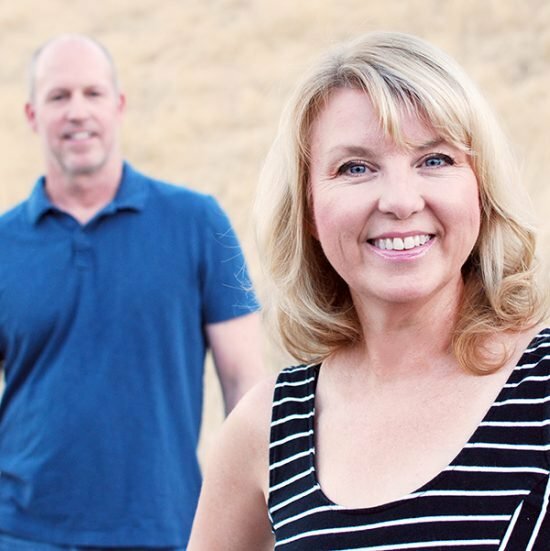 They will not be able to climb up a pole or a wall without additional support. Since this vine is such a grand plant, you might want to think about matching it with an attractive support. Try this “Jardin Flower Trellis” from ‘Gardeners Supply‘. 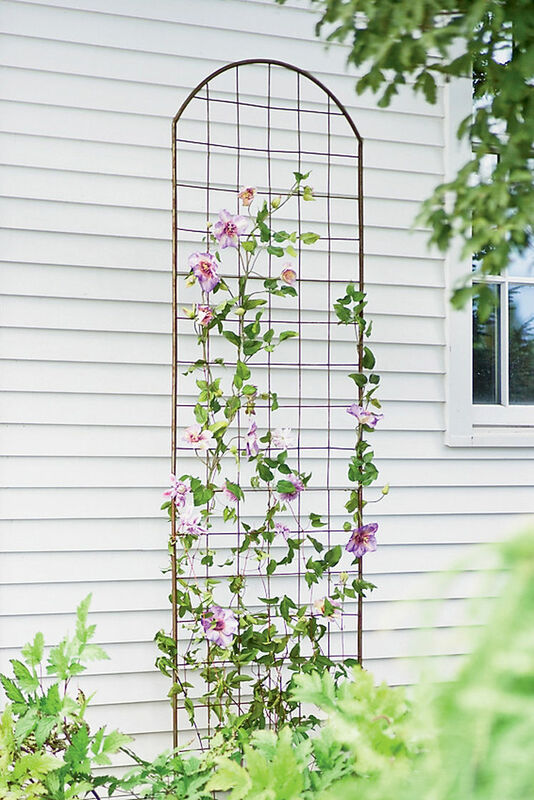 It’s lattice is the perfect spacing for clematis to grab hold, and it shows off each bloom. Even the more vigorous clematis vines, like Sweet Autumn Clematis and Clematis Montana need a little support when getting started. If you are growing them up an arbor or wall, one trick is to get them started with a little chicken wire wrapped around the bottom of the post. Once the plant gets going, it will be invisible. You only need the wire support 4-6 feet up the pole. By the time those varieties reach that height, they will be strong enough to keep going on their own. Learning exactly how to prune clematis is important, because if you prune at the wrong time, you will have no blooms! But this is easy! 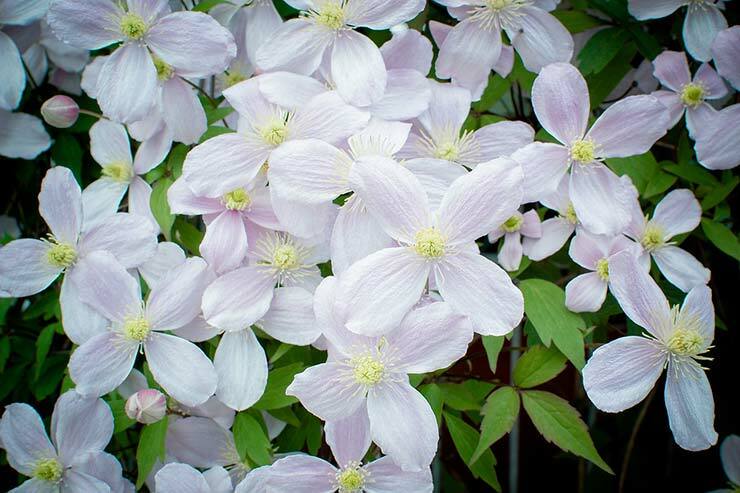 The first thing you need to know, is which of the three clematis types your plant falls under. You can check with your grower when you buy your plant. 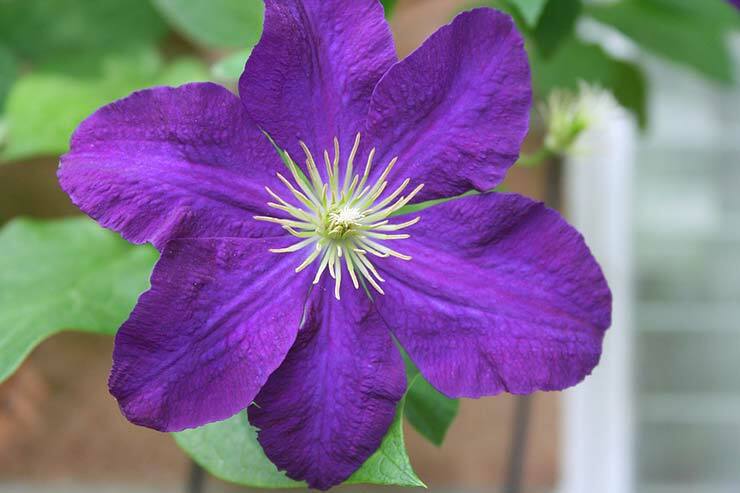 Every clematis vine should be marked as to whether it is a type 1, 2 or 3. Type 1 clematis bloom on old wood only, so they are the least complicated to prune. After flowering, simply prune back to size and shape desired. One of our favs, the spring blooming, huge growing, very fragrant Clematis Montana is a type 1 plant. Type 2 clematis vines bloom on both old and new wood. You don’t want to prune these as aggressively. 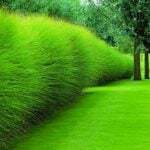 After blooming, simply prune lightly to remove weak growth or growth that is older than 4 or 5 years old. The beautiful pink “Nelly Moser’ fits into this category. Type 3 is easy. These vines only bloom on new growth, so in early spring, before the plant starts to bud out, cut back to within 12-18 inches of the ground. Some varieties that belong to this group are the old fashioned “Jackmaani”. Clematis Montana “Rubens”. This is a vigorous variety that grows 25-30 feet. It starts blooming in early spring, and will fill your entire garden with the scent of vanilla. Beloved old fashioned plant that is one of the easiest clematis to grow. Find this blush pink beauty at ‘Dutch Gardens‘. Clematis “Paniculata” (Sweet Autumn Clematis) This favorite clematis vine blooms late in the season. It is called Sweet Autumn Clematis because its fragrance perfumes the late summer and early autumn air. The flowers are smaller and more delicate than some other clematis, but much more abundant. Growing to 20 feet, this is a type 3 pruner. Find this clematis vine at ‘Michigan Bulb‘. Clematis “Henryi”. 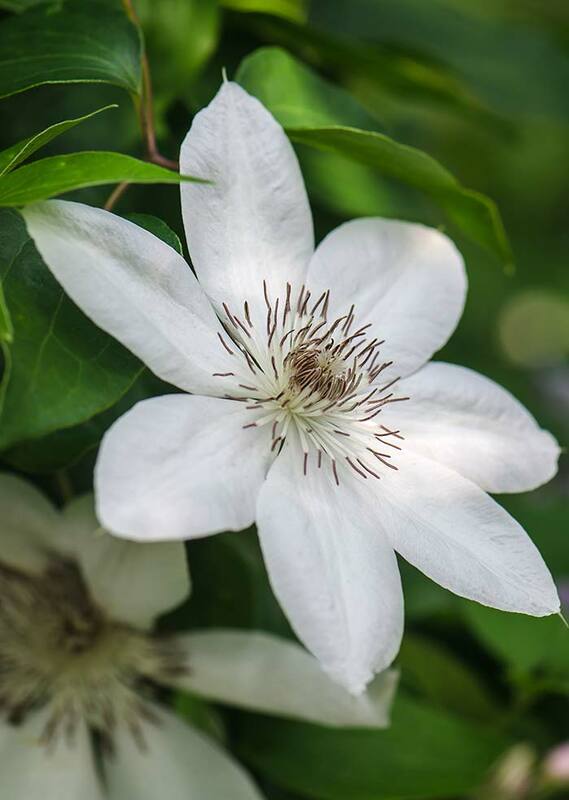 This white clematis blooms in early summer and then again later summer, with huge 6-8 inch blooms. This one was a winner of the Royal Horticultural Society’s Award of Garden Merit. 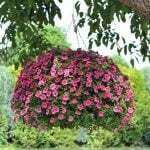 It grows 10-12 feet high, and can tolerate some shade. The deep chocolate violet stamens are stunning against the pure white flowers. Find Henryi at ‘Nature Hills‘. Type 2 pruner. Clematis “Crystal Fountain”. A double clematis in a rich blue, with these amazing sprays of lavender and lime green. This is a garden award future winner if ever we saw one! This is a type 2, hardy in zones 4-9, and blooms all summer. 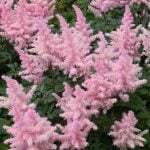 You can find this plant at ‘Dutch Gardens‘. Clematis “Carnaby”. 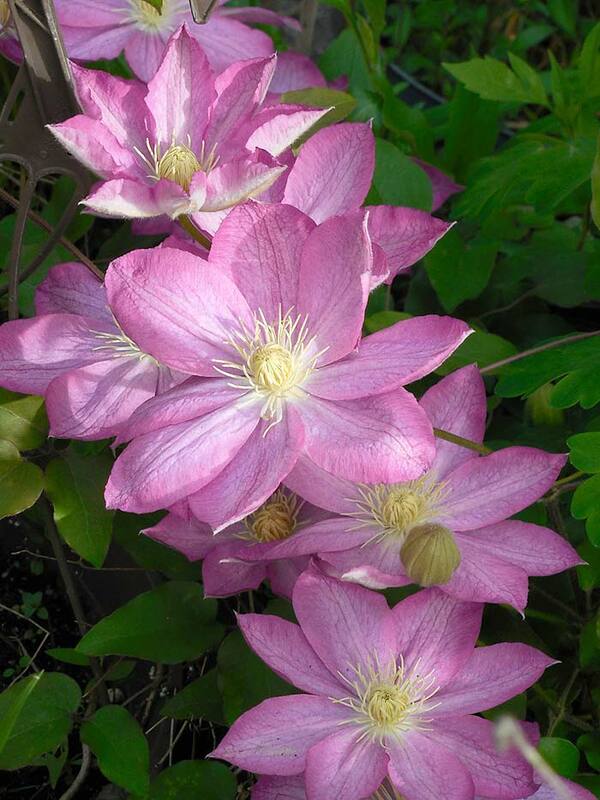 This variety is one of the few clematis that can be grown up to zone 11, and down to zone 4. A gorgeous bright pink flower that a blooms once in early summer, then again in late summer. Type 3 for pruning. Find it at ‘Spring Hill‘. Clematis “Nelly Moser”. 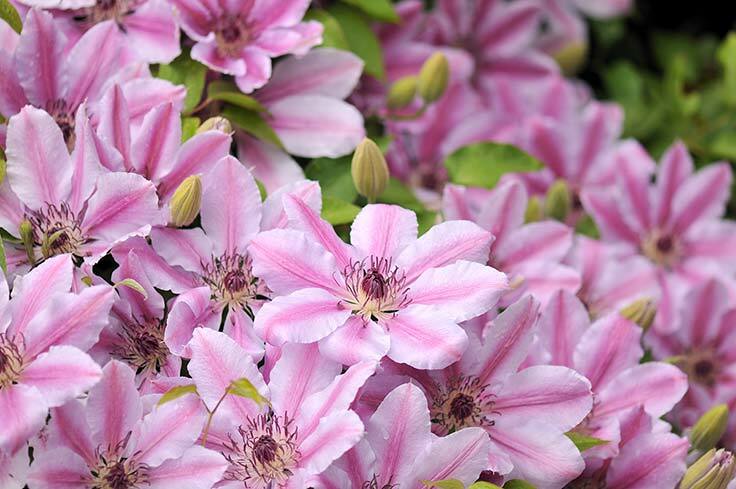 Another old fashioned clematis, Nelly Moser blooms in early summer, then again in September with this gorgeous 6 inch pink blooms. Hardy zones 3-8. Type 1 pruner. Will tolerate light shade. Find this pretty pink one at ‘Michigan Bulb‘. Clematis “Jackmanii”. 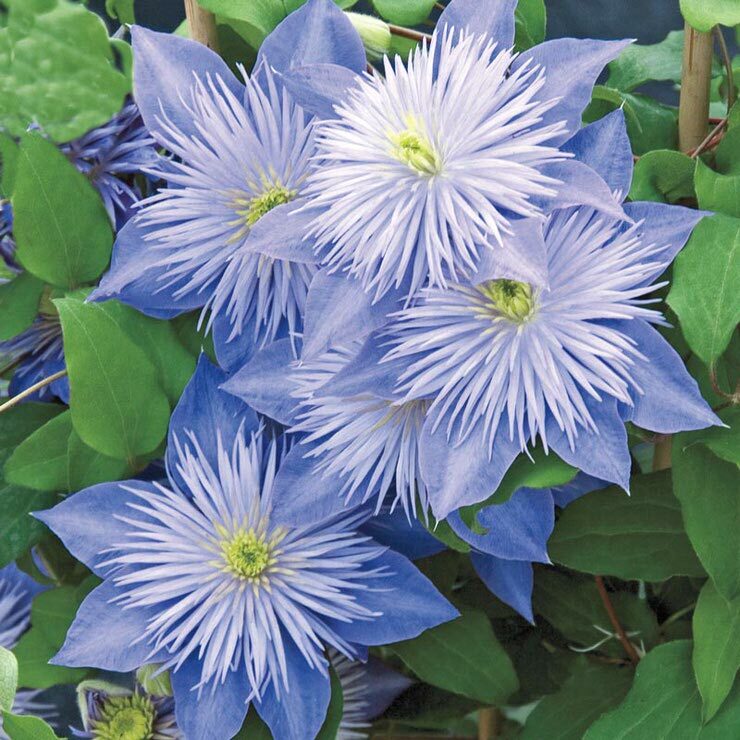 The oldest large flowered clematis hybrid, this hardy vine grows 6-8 feet with huge, violet blue flowers each summer. Type 3 pruner. 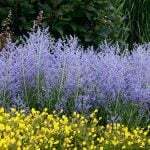 Find this pretty blue variety at ‘Burpee‘. Clematis “Nubia”. 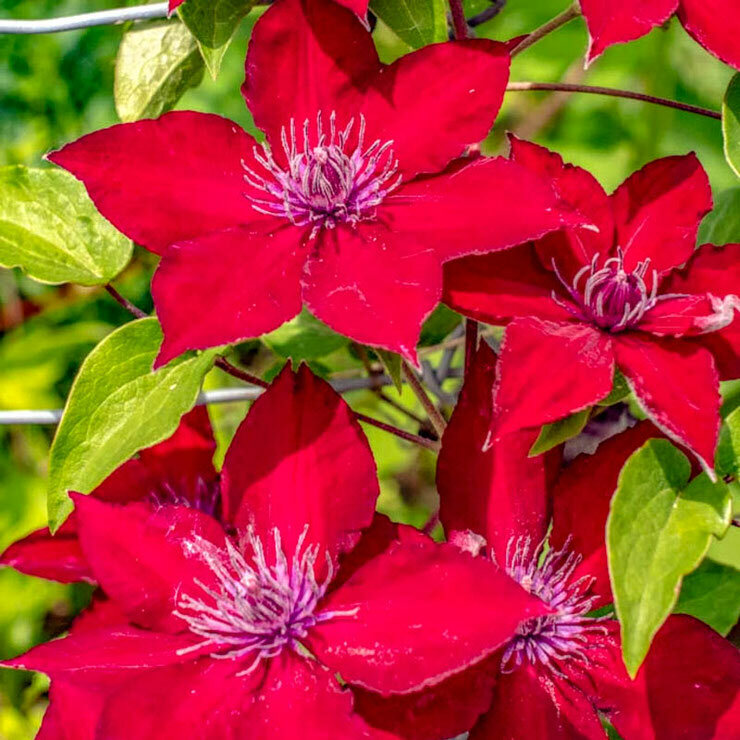 If you want a true red clematis vine, then “Nubia” is for you. Zones 4-9, 4-6 feet tall, and is a type 3 pruner. Blooms in early summer, then again in later summer. Such a show stopping bloom! Find this gorgeous variety at ‘Spring Hill‘. 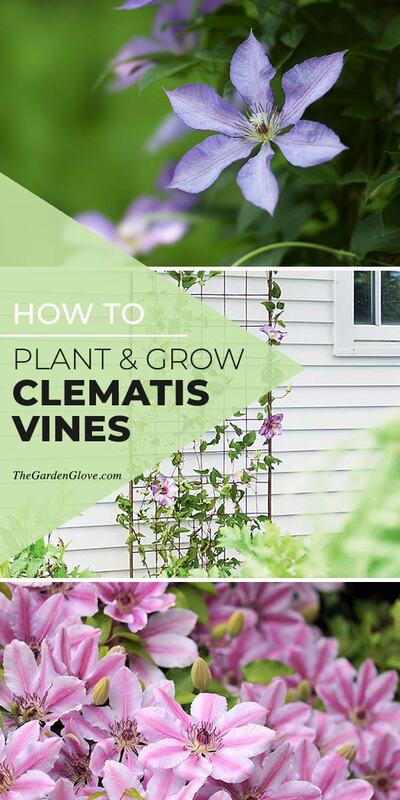 Now that you know all about growing and planting clematis vines, which one will you be trying first? We also think you will also love our posts on Planting Lilacs and Chic Trellis Projects! I was wondering to decorate mine garden corners. These clematis vines will surely help to give mine garden a new look..